Purpose: Use this document as a reference for viewing the details of a benefit plan in ctcLink. NOTE: Access for viewing a benefit plan will be determined by ctcLink security roles. 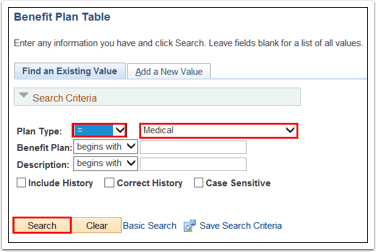 Enter the appropriate search criteria in the Plan Type section. In the example below “=” and “Medical”is used. From the search results, select the specific plan type to view. The Benefit Plan Table displays. Effective Date: Date the plan becomes active. This can be a past, present or a future date. Description: Full name of the benefit plan. Short Description: Benefit description that prints on a pay slip. SPD URL ID: Not used by SBCTC. Group Number: Not used by SBCTC. 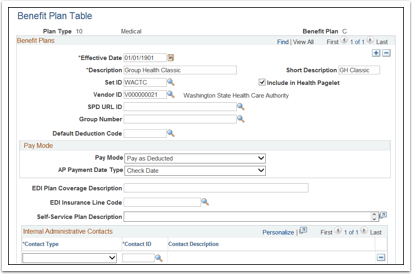 Default Deduction Code: (Optional) Entering a default deduction code eliminates typing the deduction code each time the code is associated with a benefit program on the Benefit Program Table. Pay Mode: Select when the vendor will be paid. AP Payment Date Type: Choose the Check Date or Pay Period End Date. 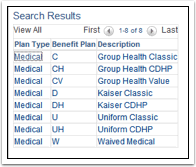 EDI Plan Coverage Description: (Optional) Enter a value that is included in the HIPPA file. Self-Service Plan Description: Not used by SBCTC. Contact Type: Select the contact type from the drop-down menu. The options are: COBRA, HIPPA or Plan Administrator.Contact ID: Benefit Administrative Contact.